this entry covers the short story “Portrait” from “Overstreet Fan Magazine” issue 4 and the “WildStorm : Chamber of Horrors” one shot. “Portrait” is a two-page story that opens with Zealot stealing something from the Coda. While Zealot is fighting we get a narration from Savant about how different they each are and why. The story ends with Zealot delivering what she took from the Coda to Savant. It’s the head of an ancient Greek statue, a statue of Zealot herself. The story ends in Savant’s office in the Smithsonian, coincidently, that’s exactly where our next story takes place! 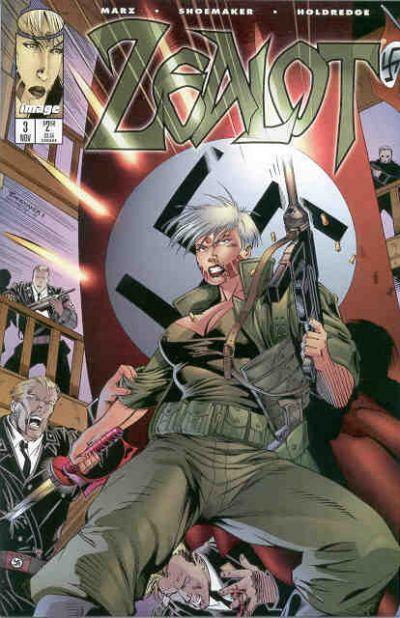 Ok, so what we have here is WildStorm’s attempt at their very own “Treehouse of Horror.” Remember when those started, there was a framing story of the Simpson kids telling scary stories to each other, and we have that here. The team, sitting around in the Smithsonian telling spooky stories. Some are stories from their past, a history of Tapestry that Zealot knows, or in Reno’s case, a horrible dream! There’s not too much here. Reno keeps having a nightmare of visiting his parents’ graves, them rising as zombies, turning into Daemonites, trying to kill him and succeeding. We’ll find out more about Reno’s background later, but it’s that as a kid some Daemonites burned down his folks’ house and he carries the guilt of not being there to save them. Him telling this story to Savant gets the whole ball of wax going. Jacob chimes in with his story from back in his Saul Baxter days. Seems he got set up with a woman whose whole body had been taken over by spiders who were then controlling her, much like 3 kids in a coat and fedora pretending to be a grown man. Also, there was a crazed axe murderer, who flummoxed the cops who shot him due to his not having a hook for a hand. Basically, a bunch of old urban legends tossed together. I don’t know if we can trust Jacob on this one. Zealot tells a story of Tapestry being the witch that set off the Salem Witch Trials. And Savant gives a story of being careful what you wish for, but back in pirate times! While all of the stories are kinda meh, these last two don’t do much storywise other than showing us a bit of WSU history. I mean, that’s what I assume because Savant saw a pirate getting hanged by the name of Henry Fletcher/the Bloody Hawk, and I can’t find any reference to him being a real person or pirate. We shoulda got some sweet WildStorm pirate stories outta that guy! In this issue, Zealot has short hair. The editor must’ve been asleep at the wheel because there’s just no way for this to’ve happened. Unless Zealot grows her hair very quickly. Is that a known Kherubim trait? Rapid hair growth? I know this kind of puts it at odds with having “Portrait” right before it, but this is something that’s best overlooked. Maybe rapid hair growth is a Kherubim trait, Savant grew quite a coiffe in a few pages! I did the research, the beehive hairdo was created in 1960, so Jacob’s story (if he’s not pulling our leg, as it’s the only story that seems like it could be false) would have to be happening shortly before the “Team One” books. So, Tapestry was active in 1692. And this was still years before Zealot had her 100 years of indentured servitude with her? 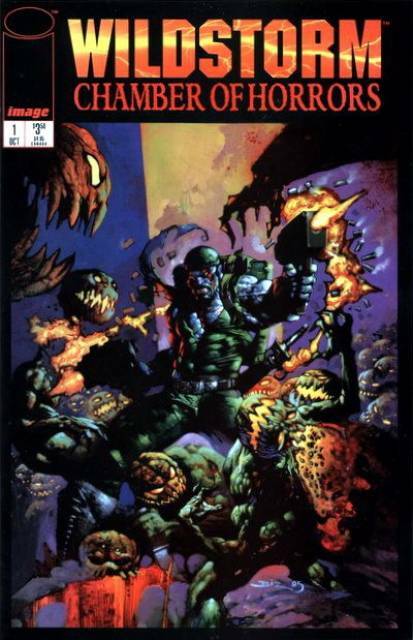 I always thought “the Price” from “WildC.A.T.s” Vol. 1 issue 13 had taken place centuries earlier! Savant still seems fine just 12 years later in 1704, so I guess she hadn’t been poisoned quite yet. Man, when does Zealot submit to Tapestry for all that time? I guess there’s still time, I mean, as long as it happens before 1860, I guess we’re still looking at a workable timeline. 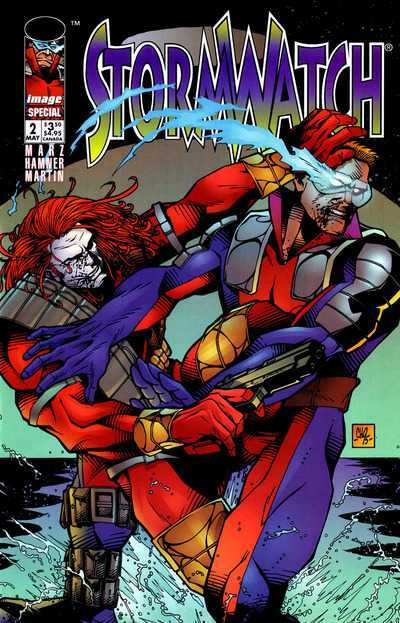 Also, yes, I do find it odd that Deathblow is on the cover of this issue and it only concerns the members of the “WildC.A.T.s” book.